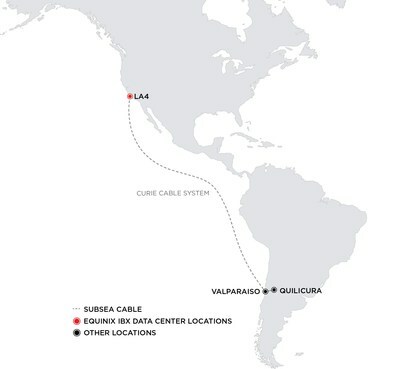 REDWOOD CITY, Calif., Feb. 7, 2019 /PRNewswire/ -- Equinix, Inc. (Nasdaq: EQIX), the global interconnection and data center company, today announced that Google has selected Equinix for its Los Angeles area cable landing station (CLS) supporting the Curie subsea cable system, the first subsea cable to Chile in the last 20 years. In the U.S., the cable will land directly at the Equinix LA4 International Business Exchange™ (IBX®) data center located in El Segundo, Calif. Google has selected Equinix as its CLS at LA4 due to the company's expertise in delivering and managing cable landing stations. The Curie cable is expected to go live in 2019. "With the significant increase in global data traffic, we see corporations running global businesses demanding access to high-capacity, low-latency networks capable of connecting them to data centers across oceans with stringent levels of reliability. Any user of a subsea cable system that lands inside one of our Equinix global data center termination points has instant, low-latency access to a host of vibrant industry ecosystems inside Equinix, and that's a huge advantage."